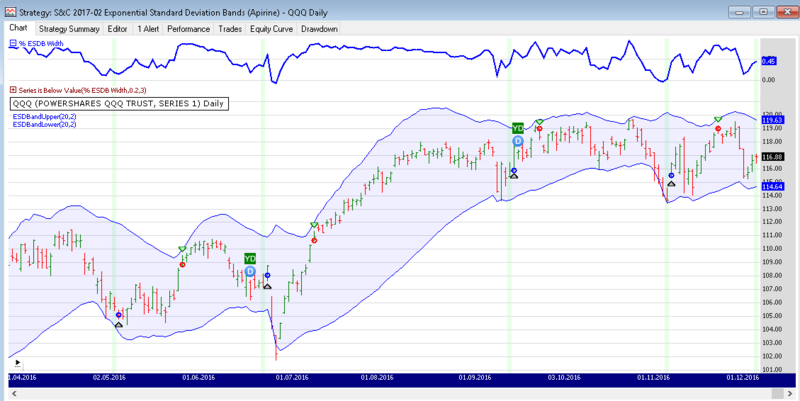 The exponential standard deviation bands (ESD bands) from this month's Traders' Tip follow the same interpretation guidelines as the traditional Bollinger Bands, for example. The difference is in the usage of exponential standard deviation which is believed to make the ESD bands more sensitive to the market action. As to the optimal condition to applying them, author Vitali Apirine suggests a flat trend. To illustrate their application we've included a simple system that is based on a %b indicator that depicts how the price relates to the bands as well as to what degree it is above or below any of the bands. If the price is equal to the upper band, %b will be 100%, if it's equal to the lower band, %b will be 0.0, and a %b value of 50% (0.5) means the price is in between i.e. equal to the EMA. To execute the example trading system, Wealth-Lab users should install (or update) the latest version of TASCIndicators library from the Extensions section of our website if they haven't already done so, and restart Wealth-Lab.